Once you add the lettuce, pita or wrap this meal honors The Menopause Makeover Food Pyramid food ratios of 35% protein, 40% carbohydrates, and 25% fats. This yummy recipe helps you fight the menopause midsection and love handles! -Puree the cottage cheese in a food processor. Add curry powder and pepper. Mix well. Puree to the desired consistency. I prefer a thicker puree, so be careful not to over-process this mixture. -Add onions, walnut halves, apples and chopped chicken to the curry mixture. -Serve on a bed of baby lettuce, or in 1/2 whole wheat pita, or 1/2 a whole wheat wrap. -Serve chilled. Please note, it is best to make this recipe a few hours before serving. Sprinkle thinly sliced scallions on top. By using curry, this scrumptious recipe contains enhanced health benefits. Curry is a blend of various spices, with the most common mixture being turmeric, ground cumin, cardamom and coriander. Curry boasts anti-inflammatory properties and can help promote neurological health. With the addition of other healthy ingredients such as onions, apples and chicken (an excellent lean meat choice), this salad is a healthy yet delicious way to jumpstart your summer. I like to serve this salad with sliced, chilled pears or apples on the side, and sparkling water with a sprig of mint … yummy! The level of protein and fiber will keep you feeling full for hours. This meal honors The Menopause Makeover Food Pyramid–it is perfectly balanced, low in calories and the perfect way to start the day. In a 10-inch oven-safe skillet, cook the potatoes in hot olive oil, uncovered over medium heat for 5 minutes. Stir occasionally. Then cover and cook for another 5 minutes until tender. Remove from heat and mix in the ham and 1/2 cup of cheddar cheese. In a mixing bowl, stir together the eggs, milk, chili peppers, oregano, salt, onions and psyllium husks. Then pour into the skillet and mix together. Lay the pepper strips on top of the frittata. Sprinkle the top with 1/4 cup of cheddar cheese. In a separate pan, stir salsa and cilantro together and heat. Cut the frittata into wedges, place the parsley as decoration next to the wedge and serve with the salsa mixture. Serve on a smaller dish with a lovely wine glass filled with chilled water and a twist of lemon. 2 small acorn squash, halved and seeded. Place cut sides up in baking dish, and cook covered in 350 oven for 1 hour. Mix OJ, cinnamon and nutmeg in pan and cook until bubbly. Drizzle over squash. Return to oven and bake uncovered for 35 mins or until tender. Makes 2 servings. PROTEIN 3.7g, SUGARS 2.0g, FIBER 6.7g, CARBS 48.1g, CALORIES 186, CALORIES FROM FAT 4, TOTAL FAT 0.5g, SATURATED FAT 0.5g, TRANS FAT 0g, CHOLESTEROL 0, SODIUM 13g, POTASSIUM 1554mg. Serve with cornish game hen, chicken or fish – yummers! keep in my freezer) any other veggies you like..
just separate into three piles. Dip into your preferred sauce and enjoy! 1. Heat oven to 375%. Spray a baking pan lightly with cooking oil. mixture. Place filets in a single layer onto prepared pan. 4. Press any remaining panko mixture onto tops of filets. 5. Bake 12-14 minutes, until flaky. Serve with lemon wedges. De-stem the kale. (Grasp the stem bottom in one hand and grasp the bottom on the leaf in the other. Saute the onion and garlic in olive oil until tender. Add the chopped kale and saute for 5-10 minutes until slightly wilted. Add vegetable broth. Simmer another 10 minutes. Add in chopped olives and rehydrated tomatoes. You can add sliced turkey sausage, cooked chopped chicken or top with cooked salmon. Before serving, sprinkle with apple cider vinegar. I sub out the short grain white rice with my Uncle Ben’s converted Brown – basically it’s a parboiled brown rice that only takes 20 min to cook rather than 45. Heat oil in nonstick skillet and stirfry these ingredients about 5 min or until chicken starts to brown. Bring to a boil then cover and simmer for about 20 min, stirring occasionally, until rice is tender and chicken is cooked. Serves six. One serving is 306 calories, 22 g protein, 2.2 g total fat. Mix the grains and seeds in a large bowl. Heat the oil, honey, and flavoring in the microwave until it is at a rolling boil (timing varies with size and power of your microwave). Pour the oil & honey over the dry ingredients and mix well, making sure all is coated. Bake in a large flat roasting pan at 225 degrees (F) for thirty minutes. Stir and bake another 20 minutes, continue to stir and bake every twenty minutes until it starts to brown. It should no longer be sticky. Store in an airtight cool place. Add additional protein powder to recipe OR enjoy with your favorite morning protein serving. Melt butter in non stick pan on med-high. Pour in egg, sprinkle turkey and cheese on top. Cut pita in half and drop in toaster to warm. As eggs start to set, scumble together with spatula in a stirring/chopping/incorporating motion and shape in an even circle a little	smaller than the pita. Let brown slightly. You want the cheese to brown but not the egg. Turn over to brown other side. Cut in half and place one half in each half of warm pita or wrap. Options: if using plain egg beaters or eggs you can add your favorite seasoning when adding the cheese. 1 serving with pita: 174 cal, 9g carbs, 17g protein, 1g fiber, 7.5g fat, 4.5g sat fat. 1 serving with wrap: 159 cal, 5.5g carbs, 18g protein, 3.5g fiber, 8.5g fat, 4.5g sat fat. 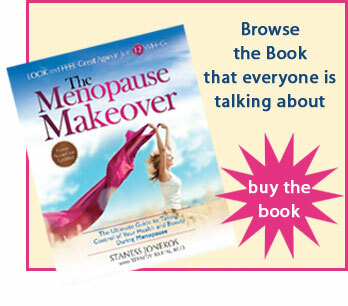 Menopause Makeover approved: a perfect recipe to start the day! Serve with salsa – yummy. (I first had this at a Sheraton banquet years ago and it’s been a fave ever since). Steam or boil your vegetables until cooked to your liking. Add the margarine and brown sugar and stir. Sprinkle on the dill and mix. I have always used dried dillweed but we discovered Litehouse Freeze Dried herbs and they have SO much more flavour! It made a huge difference using that dill last night. Delicious! My kids love it. Trim the woody ends of the asparagus, and space them out in a single layer on a foil lined cookie sheet. Drizzle with olive oil and use the flat of your hand to roll the spears so they have an even thin layer of oil on them. Sprinkle with a little bit of seasoning, and put in a 425 degree oven for 13 min. The best part? The tips get the tiniest bit crispy. Menopause Makeover approved: This roasted asparagus dish is excellent with fish, chicken or pork tenderloin. I buy frozen salmon fillets – each one is about 4 oz I think. One package usually has five fillets in it (one for everyone plus one for dh’s lunch the next day). Drizzle the marinade over the salmon and put in the fridge for a few hours. Put foil on your barbeque and then grill the salmon on med-low until it flakes easily. It’s super easy and super yummy. In non barbeque weather, you can just do it in the oven. Email Staness@MenopauseMakeover.com and submit your recipe. If your recipe is Menopause Makeover approved, it will be posted for other women to enjoy. You may submit a recipe and/or a menu. Once you submit your recipe you will automatically be entered to win a FREE one hour personal Menopause Makeover consultation with Staness. The winner will be randomly selected and announced August 1, 2010. Inspire others with your delicious Menopause Makeover Approved healthy dish!